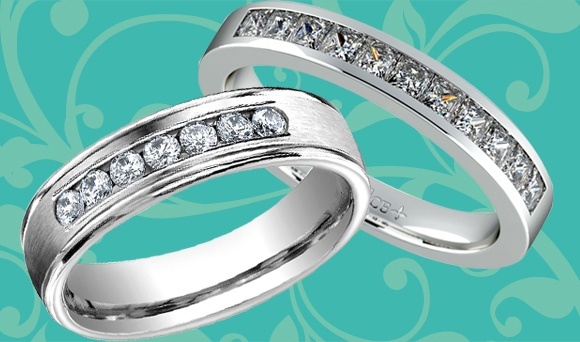 The wedding band is a married couple’s symbol of eternal love, but over the years, it can show signs of wear and tear. While many resist the idea of exchanging the wedding rings they’ve worn for decades out of sentimentality, others recognize the need to upgrade them to reflect the times, their own experience in marriage, and other factors. Here are some great ways to improve your wedding ring without totally replacing it. Inlay your old band with a new one. Contrasting precious metals, such as yellow gold with silver or white gold, can look quite beautiful on your finger. If you aren’t too satisfied with how your old wedding band metal looks or feels (some of the softer precious metals can show nicks, scratches, or worse, dents), don’t throw it away yet. Instead, consider getting it inlaid onto a sturdier precious metal such as titanium or platinum. These are hypoallergenic and durable, and can give a more comfortable fit, plus a striking contrast to shinier metals. Embed precious stones to form a time line on the band. Plain bands can get a gorgeous upgrade with a few small, precious stones. Each important anniversary can be marked by a gem stone, such as a sapphire on the fifth year of marriage, a diamond on the tenth, a ruby on the fifteenth, and so forth. You don’t have to put all the anniversary stones on one band (it could admittedly end up looking garish), but carefully select your milestone years and their corresponding gem stones to have a truly meaningful and classy time line on your finger. Engrave a noteworthy catch word or phrase. Shared experiences are likely to yield a couple of terms significant to a married couple. It can be a term of endearment, a favorite line from a song, poem, book, or movie, or just about anything which holds plenty of meaning for the two of you. Why not have it engraved on your wedding band to reflect your closeness? A recent jewelry trend is fast becoming a hit for couples who want to enhance their wedding rings. Stacked wedding bands are now being seen on celebrities’ fingers, such as Sarah Jessica Parker’s and Reese Witherspoon’s. This is a great option for couples who were not able to afford the wedding band they wanted in the past, and had to settle for something within their budget. They can add another band of the precious metal, design, and gem stone of their choice on top or below to match the original wedding band.